Are you a person who’s been buying those little bottles of eye makeup remover at the store? If you are, then you also know that you can expect to pay somewhere between $4 to $9 for a tiny bottle of the stuff. Booooo. Who wants to save some money instead? I’ve been using this homemade alternative that works great and when I did the math, I discovered it was costing me only pennies for a batch the size of those little bottles at the store. A larger batch that was three times the size of those little bottles still only cost me 28 cents. Distilled Water: For a mixture like this that will take you several weeks to use and also is being used as a cleanser, it’s best to use distilled water or purified water of some sort rather than just water from the tap. 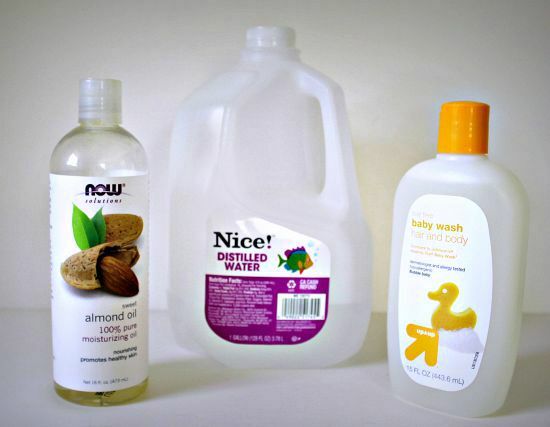 You can buy distilled water at drugstores and grocery stores. At the time of this writing I was able to buy distilled water for 89 cents per gallon. Gentle Tear Free Soap: Because this is a cleanser being used on your eyes, you need a soap that’s very gentle and the types that are marketed as being tear-free for babies work perfectly. I use the Target brand tear-free baby wash and at the time of this writing the cost was $1.67 for a 15 oz bottle. You could also use a tear-free baby shampoo or if you prefer a more natural option, you can use the Dr. Bronner’s Unscented Baby Castile Soap. Oil: The final ingredient is an oil to help with the makeup removal and to add some moisturizing too. I had some Almond Oil in the house which was my choice to use in this recipe. However ordinary olive oil will work too, or coconut oil, or another oil of your preference. Olive oil is probably the easiest and most frugal option for many folks and a bottle will most likely cost you between $5 and $7. And once you have your three ingredients it’s a quick and simple process to make your own eye makeup remover. Just a bit of measuring and stirring and you’re good to go! I’ve included two recipes below for a small size batch or a large size batch. The small size batch is 4 ounces which is close to the size of the bottles you’ll find at the store. But if you go through makeup remover quickly and want a bigger sized batch, I’ve included a large size recipe option too that makes 12 ounces. Combine all ingredients and store in a covered jar or bottle. To use, moisten a cotton ball, cotton round, or tissue with a small amount of the remover and rub gently over your eyes to remove makeup. Combine all ingredients and store in a covered jar or bottle. 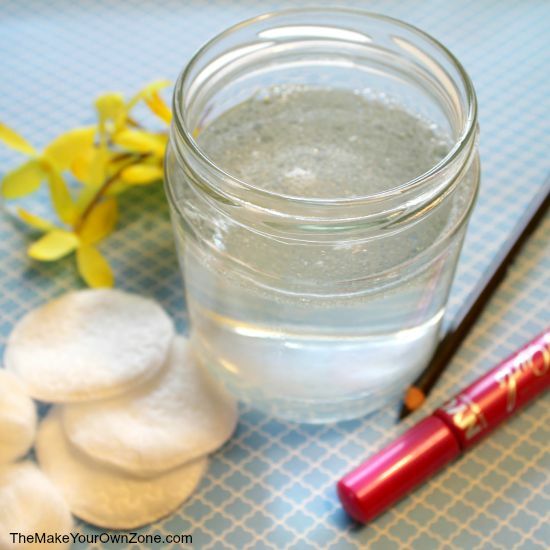 Once you have your DIY eye makeup remover mixed together, here are some options for storage. You can just keep the entire batch of makeup remover in a jar and just dip your cotton balls, etc. in it when you’re using it. 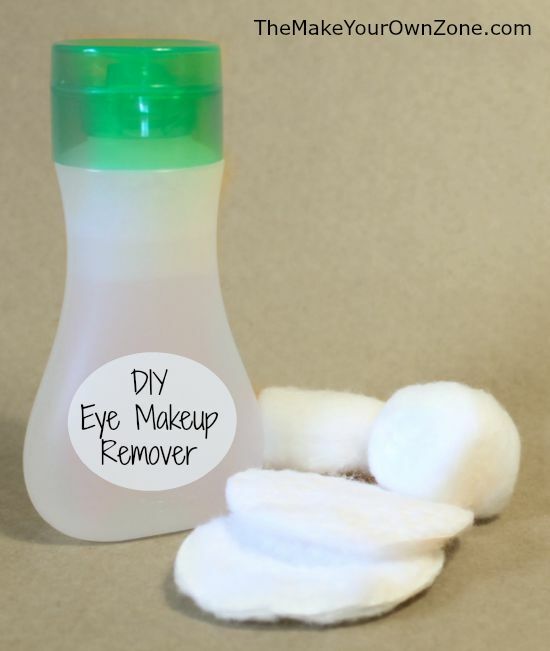 I like to transfer some of my eye makeup remover to a small squirt bottle and just squirt some onto a cotton ball, cotton round, or tissue when I want to use it. If you like the method of having a pre-moistened towelette (like the Neutrogena Makeup Remover Towelettes ) you can buy some of the cotton rounds, place some in a wide mouth jar and then pour some of your homemade eye makeup remover over them to moisten them. I’ve found it’s a little tricky to get the cotton rounds moist without getting them really soggy and saturated so I don’t have the perfect proportions to share with you. Nevertheless, it’s definitely an option and will work fine once you find the amount of moistening that you like best. 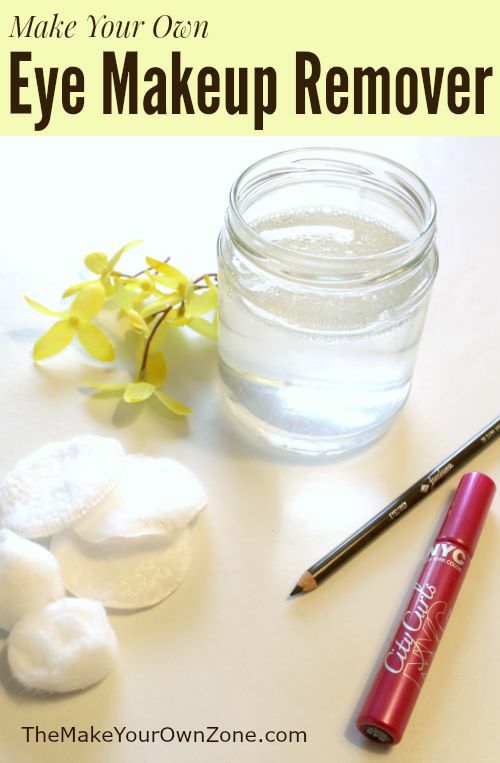 And finally, even though this recipe is an excellent eye makeup remover, it can be used for other makeup removal or skin cleansing too, or for moistening any other kind of homemade quick-wipe towelette you would like to make. I just ran out of my eye make up remover and wanted to try making my own! 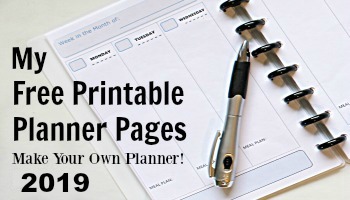 Pinning this to try later this week! Does it wipe off waterproof makeup Beverly? Yes, I believe the gentle soap and the oil in this mixture should work to take off waterproof eye makeup, although some waterproof brands are more stubborn than others! This is perfect! I usually just use straight olive oil but it definitely can get messy/gross so I love this option! Thanks for sharing!